Remus found loopholes in the Volstead act through which he could buy whiskey for “medicinal purposes”, helping to make him the biggest bootlegger on the eastern side of the country. In only three years time, he amassed over 40 million dollars in profits which he used in part to bribe officials. Remus’s empire of liquor had two major effects on crime in Newport. 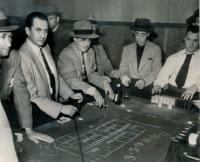 It formalized corruption and his bootlegging syndicate would initiate many of the major actors of gambling in the city. Bust out joints, small and greedy gambling establishments, would not let a costumer out until he or she was “bust” by using rigged games or games with nearly impossible odds of victory for the costumers. Many of the bust out joints also offered prostitution services for their customers. Prostitution was so bad in Newport and so open the public that there were over 9 brothels within a block of the police headquarters. These are just a few fascinating facts. But the best way to immerse yourself in the bootlegging era is to take the Gangster Tour offered by American Legacy Tours. Having been on this tour, I can tell you that Vegas has nothing on Northern Kentucky! Don’t take my word for it, check it out for yourself and let us know what you think. Be sure to use #NKY so we can share in your adventures!